The Forum Romanum is located in a valley between the Capitoline Hill on the west, the Palatine Hill on the south, the Velia on the east and Quirinal Hill and the Esquiline Hill to the north. The Velia was levelled in Antiquity. The importance of the Forum area is indicated by the presence of many of the central political, religious and judicial buildings in Rome. The Regia was the residence of the kings, and later of the rex sacrorum and pontifex maximus; the Curia, was the meeting place of the Senate; and the Comitium and the Rostra, where public meetings were held. Major temples and sanctuaries in the Forum include the Temple of Castor and Pollux, the Temple of Saturn and the Temple of Vesta. Commercial and judicial activities took place in the basilicas, the two remaining are the Basilica Aemilia and the Basilica Julia. Due to the political importance of the area there were also numerous honorary monuments. Originally the area of the Forum was humid and covered in grass, as it was not suitable for construction. A necropolis has been found, dating from the 10th century BCE, but otherwise the area doesn't seem to have been used much. This changed in the 7th century with the construction of the Cloaca Maxima. This sewer system was based on a natural stream, which was enclosed and covered to drain the area, a sign that the settlements on the Palatine Hill was spreading into the valley. Gradually more public buildings were constructed around the square, thus forming a natural centre for the rapidly growing town. According to legend, the second king of Rome, Numa Pompilius, instituted the cult of Vesta and built the Regia, Tullius Hostilius built the first Curia and enclosed the area of the Comitium, and Tarquinius Priscus ordered the Forum paved around 600 BCE. While the role of the kings cannot be proven, the dates are largely confirmed by archaeological research. Other very old monuments in the Forum area are the Vulcanal and the Lapis Niger. In republican times the construction on the Forum continued, with a series of basilicas, notably the Basilica Sempronia and the Basilica Aemilia. Also from this period are the Temple of Saturn, the Temple of Castor and Pollux and the Temple of Concord. The current image of the Forum Romanum is a result of the changes made by Julius Caesar as pontifex maximus and dictator, which included the construction of the Basilica Julia where the Basilica Sempronia stood, the building of a new Curia and the renovation of the Rostra, the speakers platform. Caesar didn't see all his plans realised before his death, but most was finished by his successor Augustus, including the Temple of Divus Julius, dedicated to Caesar deified. In imperial times the importance of the Forum as a political centre diminished, but it remained a centre of commerce and religious life. Construction and restoration continued, but now mostly in the form of honorary monuments, such as the Arch of Augustus, the Arch of Titus and the Arch of Septimius Severus. Other arches, such as the Arch of Tiberius, have disappeared completely. New religious buildings included the Temple of Antoninus and Faustina and the Temple of Vespasian and Titus. The Basilica of Maxentius from the 4th century is one of the last major additions to the Forum. The Column of Phocas was the last monument to be erected in the Forum in 608 CE, but at this time the area was already half in ruin. 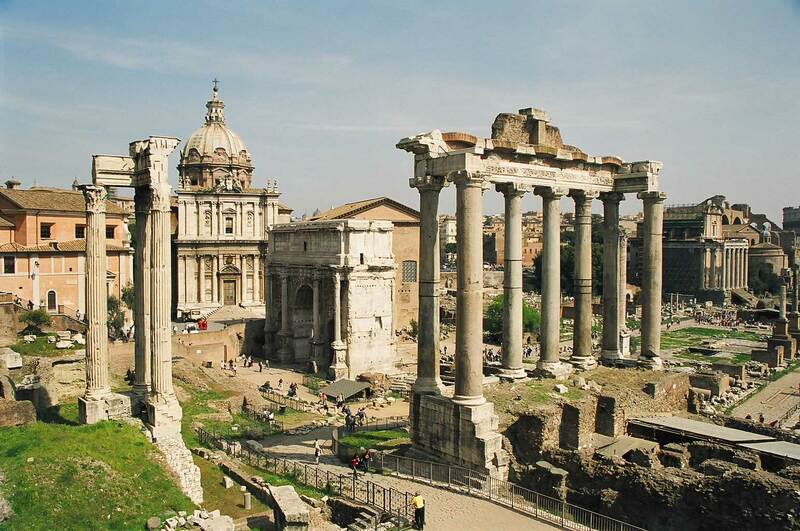 The Forum Romanum suffered damage and destruction repeatedly. When political strife in republican times deteriorated into violence, the Forum would regularly be the scene of fierce fights between rivalling factions, often followed by destructive fires. Fire was always a problem in ancient Rome, and parts of the Forum burnt down several times, the worst fire being in 283 CE. Later the Forum suffered destruction and pillage at the hands of invaders. Most of the buildings on the Forum was destroyed completely in 410 CE, when the Ostrogoths of Alaric sacked the town. Many religious sites were abandoned and fell in ruin after the ban of non-Christian cults in 394 CE. After the fall of the empire in the west, the area was abandoned. A few buildings were converted into churches, including the Curia, the Temple of Antoninus and Faustina and the Temple of Divus Romulus; the rest was left to shepherds and their animals, to the extent that the popular name of the area became Campo Vaccino, the cattle field. Many of the buildings served as quarries for other construction sites in the city during the renaissance and later, and gradually dirt piled up to 5-7 m above the street level of antiquity, covering all but the tallest ruins. This difference can be seen clearly on the church of San Lorenzo in Miranda (Temple of Antoninus and Faustina), where the door now sits halfway up the wall. It used to be level with the ground. Archaeological excavations began in 18th century, but the site have only been excavated systematically in the 20th century. Many of the later additions to buildings and monuments have now been removed and the original street level has been restored over large parts of the Forum. The site of the Forum Romanum is still subject to excavations, and several parts of the Forum cannot be visited, but the whole area have the status of an archaeological site, open to visitors.